I wish I had a sexier name for this dish but when you start combining things into a dish that really doesn’t have a name like ‘taco’ or ‘grain bowl’, a name with all the ingredients is the best I can do. However, it’s delicious. We’ve eaten it as a side but I’ve also been known to call a dish like this lunch. When spring produce enters into my life, I take it as a reminder that not everything requires roasting. Sure, roasted vegetables are amazing but sometimes other techniques are worthwhile. I feel like steaming gets a bad rap, most likely due to diet trends, but it’s a valuable tool in your cooking arsenal. Take for example these beets. 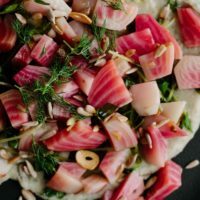 Chioggia beets are beautiful. Their color, though, doesn’t hold once cooking. 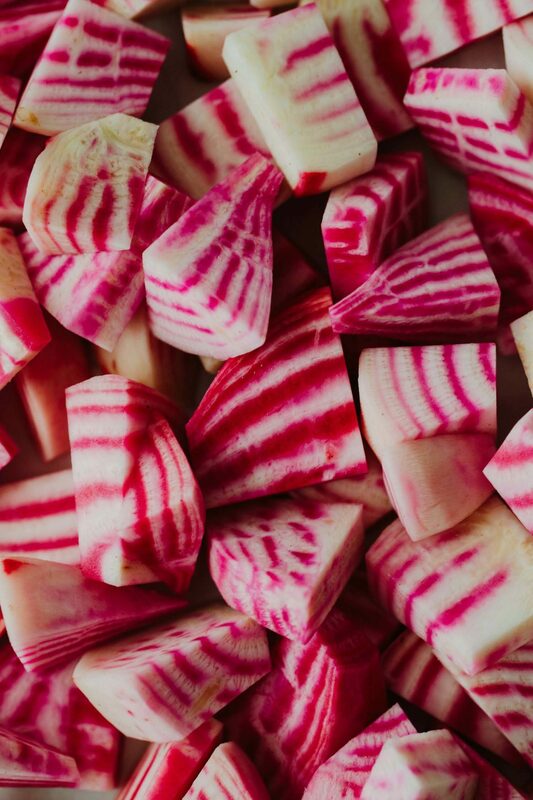 If you roast these beautiful beets, the color fades pretty drastically (unless you roast them whole but I’m not always willing to wait the hour it takes.) Enter: steaming. Steaming these beets takes 10 minutes and while the color still fades slightly, it’s there in all it’s beautiful pink glory. Best of all, steaming the beets leaves room to make crispy garlic in ghee: a real treat for all. Garlic + Ghee: best friends. I’m a big proponent that every dish should have a little crispiness to it. 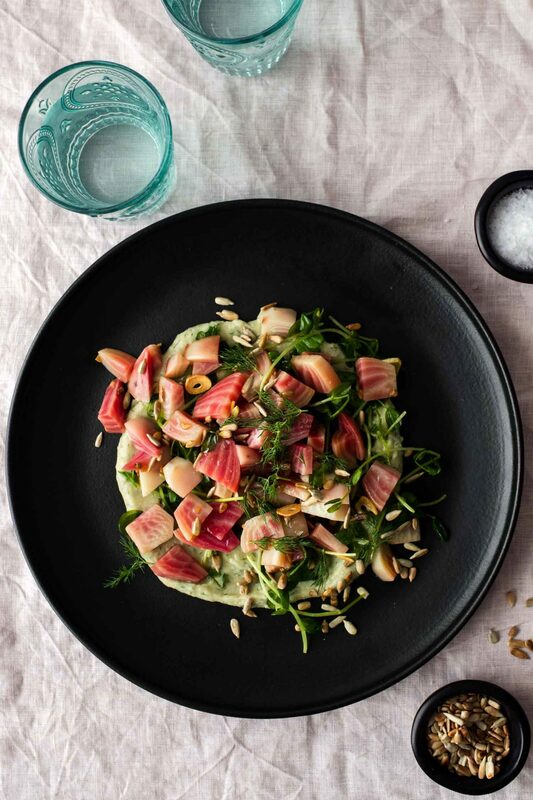 In this dish, the sunflower seeds are nice but my favorite crisp comes in the form of pan-fried garlic. The ghee crisps the garlic nicely all while adding that delicious ghee flavor. Finally, the bean puree. I love piling vegetable high atop a creamy puree. There’s something so satisfying when you scoop everything together off the plate- it mixes into the perfect bite. I kept this bean puree simple and very spring forward with the help of dill. Of course, you could really use any herb. Try parsley, marjoram, and/or a bit of thyme. Also, if you don’t have white beans go for chickpeas. Peel, trim, and cut the beets into ¼” thick half-circles. Add water to the bottom of a pan that is fitted with a steaming basket. Bring the water to a boil, add the beets to the steaming basket, cover, and cook until the beets are tender but still have a bit of texture, about 10 minutes. While the beets are cooking, peel and thinly slice the garlic. Melt the ghee in a pan and add the garlic. Cook until the garlic is golden and crisp. Remove from heat and stir in the salt. Next, make the bean puree. Combine the beans with the lemon zest, juice, dill, and salt. Puree, adding just enough of the liquid, until the bean puree is smooth. 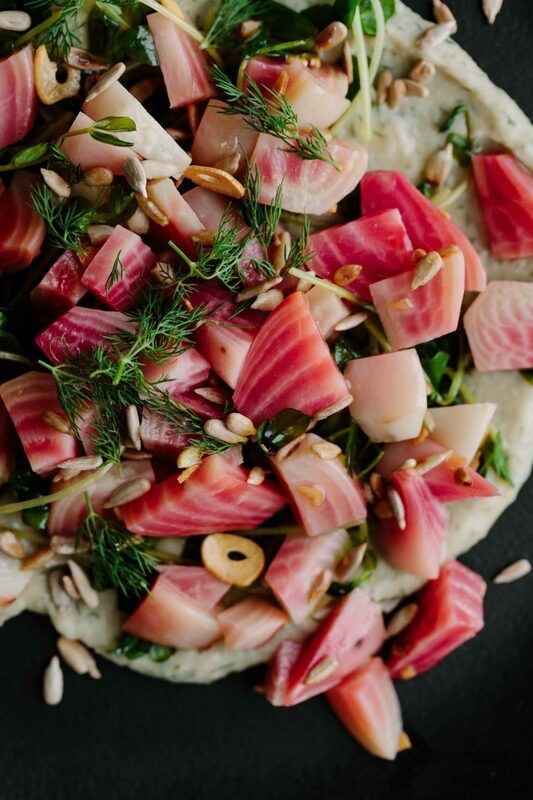 Once the beets are done, let cool slightly then combine with pea shoots and sunflower seeds. Drizzle with the ghee/crunchy garlic. Squeeze a bit of lemon juice on top and toss until everything is well combined. Take the white bean mixture and smear onto a plate or bowl. Top with the beet mixture and serve with a sprinkle of flaky sea salt, because why not.